Kerala Entrance Results 2014 is declared by the Commissioner for Entrance Examiantions Kerala. KEAM Results 2014 (Kerala Engineering and Medical Entrance) declared on 15th May 2014. KEAM Results are available on the official website of CEE Kerala and Kerala NIC Wesbsite. According to CEE Kerala, the rank lists of medical entrance exam and the score of engineering entrance exam will be declared at 4 pm by Kerala Education Minister PK Abdu Rabb in a press conference scheduled at Thiruvananthapuram. Kerala Engineering Agriculture Entrance Test KEAM 2014 was conducted on 21st and 22nd April 2014. KEAM 2014 Medical Entrance Test was on 23rd April 2014. 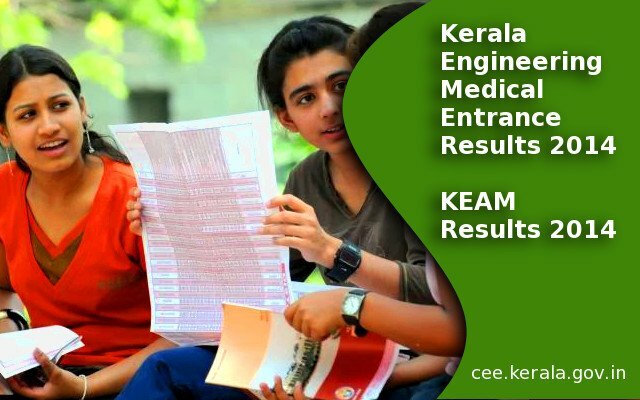 Kerala Engineering & Medical Entrance Test Results – KEAM 2014 Results are available on 15th May 2014. KEAM 2014 Engineering Rank List will be published on June 2014. The rank list is available after the Normalization Process. Student has to Wait until 25th June 2014 for Announcement of KEAM 2014 Engineering Rank List. The KEAM 2014 Engineering Rank list will be prepared by giving equal weightage to KEAM 2014 Entrance Score and Normalized Board Examination Marks. The Commissionerate of Entrance Examinations (CEE) is conducting Kerala Entrance Examinations for admission to Engineering and Medical Courses every year. Kerala Engineering Agriculture Medical Entrance (KEAM), Three year LLB , Five year LLB, LLM, MCA, PG Ayurveda, PG Homoeo, PG Nursing and Super Specialty are the exam conducted by CEE Kerala. The Commissionerate is also making allotments to KEAM, Three year LLB, Five year LLB, LLM , MCA , PG Dental and PG Medical courses. The allotment to KEAM, Three year LLB , Five year LLB and MCA are made through a Single Window System of the Centralised Allotment Process (CAP). KEAM 2014 cutoff marks will be announced for all the category General , OBC , SC, ST . After the check the Keam score students will be eligible for next round i.e. KEam 2014 Counselling for Engineering , Medical , Architecture .